You know the drums of privatization are beating when the corporate mainstream media have their tongue so far up John Key's arse that they make Tibetan throat singing sound like perfectly articulated Shakespeare. 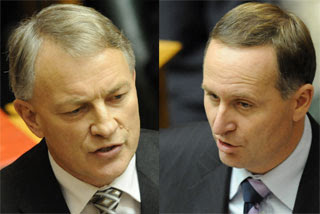 Three stories in the Weakend Herald focused on Phil Goff's hair colour. It's not the hair that's died, it's the quality of journalism. Audrey Young embarrasses herself with her weak analysis of Key's decision to privatize our State Assets that we have all already paid for, she claims that Key can water down the sales if they start to turn the polls, this is a lie. Key has already stated he'll lose the election rather than not sell and that protests will not budge him from this decision. She is excusing him, not holding him to account and that is what we are seeing in apologist editorial after apologist editorial is the interests of the corporate elite being expressed, not the interests of the people. Why are the editorials ignoring Keith Ng? Yes, you can sell your house to pay off the mortgage, then you’ll be mortgage-free. But you’ll also be minus a house. In New Zealand’s case, we can sell our SOEs to pay off debt, which means we’d pay less interest to overseas creditors. But if we sold the SOEs to foreigners, then we’d just end up paying dividends to foreign investors instead. Why are the editorials ignoring Selwyn Pellet? Both the media and the public need to look deeper than the carefully constructed sound bites coming from the government on its asset sales plan, because the long term consequences for New Zealand are massive. In effect John Key has, by resurrecting a failed strategy from our past, signaled that he and his government have no idea how to grow the economy and demonstrated that National’s ideological views are driving its decisions without reference to the reality of the situation we find ourselves in. Sweet Jesus, why are the editorials ignoring the bloody Treasury? The total lack of scrutiny of Key's ridiculous excuses to privatize is inexcusable especially when those reasons are so easy to attack and dismantle, in fact the intellectual laziness he has used to justify flogging off our assets suggest Key was pushed over the holidays into using his smile and wave political capital to calm the Auckland business mafia who bank rolled the 2008 election campaign rather than any genuine rational for a privatization agenda. Key claims we need to privatize our assets to avoid a Standard and Poor's credit downgrade because our debt is so high, this is a lie. It's not Government debt that is high, it's private debt! NZ only spent 1.22% of GDP on debt-servicing in 2010! Cullen did the right thing by paying down the Government debt during the good years, it's the private debt, the student loans, the credit card hyper consumer culture, the property speculation all fueled on cheap credit that is to blame - NOT Government investment into society! Key claims to use the privatization of our assets to pay down our debt, but we are currently borrowing a Billion per month, he hopes to get $10 billion from these sales, that's 10 months worth of borrowing he will get, I've heard of short term solutions, but privatizing our assets for less than a years benefit is a smile and wave too far! Key has said 'Mum and Dad' investors so often he sounds like a parrot with a cracker (or should that be a cracker with a parrot?). This is spin, once sold to 'mum and dad investors' they are free to sell to whom the like, and as the Treasury papers point out, they will end up in the hands of over seas investors. Bill English couldn't justify why he wouldn't sell the remaining 51% on Radio NZ on Friday, and if John Key says we need the money now, what will change in 10 months time when he needs more money? John Key lied to our faces about not raising GST, why believe him now? Of the 300 million we are borrowing every week, $120 million is for the tax cuts. You want to lower our borrowing while generating more revenue, reverse the tax cuts for those on the top! I've always pointed out the first term would be Labour-lite and that it would be the second term that we saw the creamy full bodied right wing National Party at it's worst, and now we have it. John Key isn't ideological, he is theological when it comes to privatization, he's basing it all on free market faith right when the free market has shown itself up for the corrupt system of greed it ultimately becomes without Keynesian managed capitalism. Bomber Key is not being theological. His class knows the system is tanking and they don't care what happens as long as they keep as much as they can of the silver when the ship goes down. 10 days is a long time for a collapsing system. Ask the Egyptians.